This chapter will introduce to the issue of phase resetting of populations of synchronized oscillators. The studies of Winfree (1980) will serve as a starting point for discussing advantages and drawbacks of different types of deterministic models. This will prepare us for the stochastic approach to phase resetting (Tass 1996a, 1996b). Along the lines of this approach a population of biological oscillators will be modeled by an ensemble of phase oscillators. The latter consists of identical oscillators subjected to fluctuations and the stimulus’ impact. No deterministic interactions between the oscillators are taken into account. 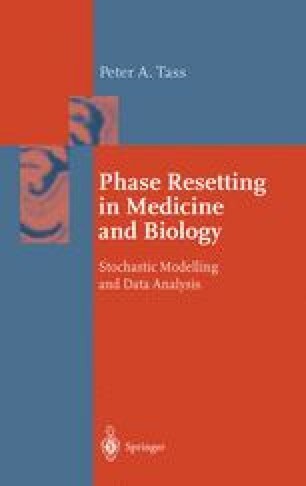 This rather simple model will allow us to assess the consequences of investigating phase resetting in terms of statistical physics. In particular, in comparison with the deterministic models one encounters qualitatively different phenomena which are important for the understanding of stimulation experiments. The influence of deterministic couplings on the stimulation induced dynamics in a noisy setting will be postponed and analyzed in detail in subsequent chapters.